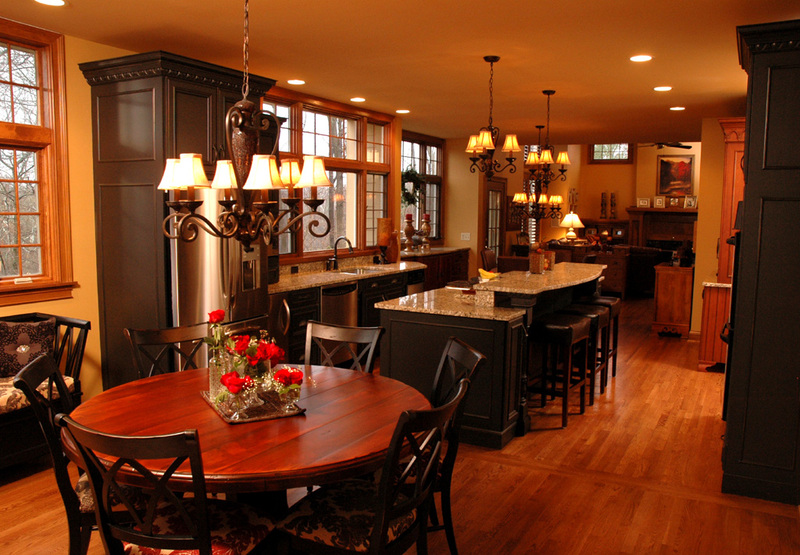 Kitchens are always the spot where people like to gather, especially during the holidays. If you enjoy entertaining, how can you optimize the space in your kitchen to accommodate guests yet be functional for everyday use? Here are nine kitchen design ideas to help make holiday entertaining more enjoyable for you and your guests. 1. A kitchen designed for entertaining begins with an open floor plan. If one of the reasons you are remodeling is to gain more space, is it feasible to add more square footage with an addition or will removing a wall and/or reconfiguring the existing layout provide a solution? 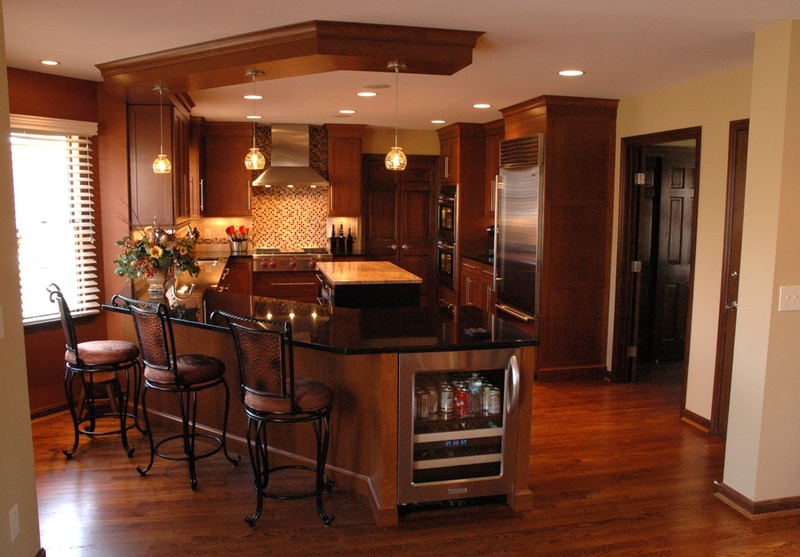 Create a kitchen floor plan that allows people to move about to adjacent rooms. Also, consider outdoor spaces. Does the kitchen open to a deck or patio area? Efficient layout is important. The cooking area should be placed away from traffic flow to allow the cook to work without bumping into people. Tiered peninsulas or islands can function in several ways. The upper counter can be used for seating and dining, and lower counter for serving food and food prep. A peninsula can help divide open space and be accessed from two sides. 3. Add an island or two. An island can be a central gathering place in a kitchen and also be used for setting up food for guests. If your space permits, consider the advantages of two islands instead of one large island, which can sometimes be an obstacle. Two islands in a kitchen can ease entertaining if one is used for food prep and the other for set up. 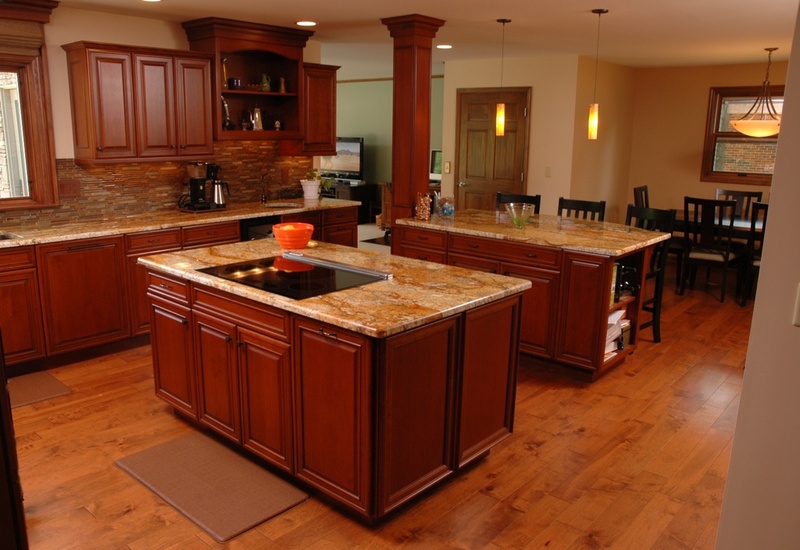 Aisles surrounding the island should be 36" to 42" to allow people to move around in the kitchen. 4. Add seating to an island or peninsula. Counter seating is a must for both entertaining and informal everyday dining. Bar stools come in 36” and 42” heights. The 42” stool can be used for tiered counters. The advantage of a tiered counter is that guests can sit and talk with the cook without interfering with the food prep area. The overhang of the counter should be 12” to 18”; a deeper overhang provides more knee room. There are many styles of stools on the market. Check the width. Typically, stools are 24” to 30” wide. 5. Add a beverage bar. A beverage bar is an asset for entertaining. It’s a place to store wine and glassware but also can be a station for coffee, tea or cold drinks. Consider a bar sink for filling the coffee maker and electric teapot. A sink filled with ice can serve as a cooler for drinks when you’re entertaining. It’s always helpful to have an extra sink in a kitchen to wash vegetables or thaw meat when you’re preparing food for a crowd. An under-counter refrigerator can provide extra storage for beer, wine, juices and other drinks. 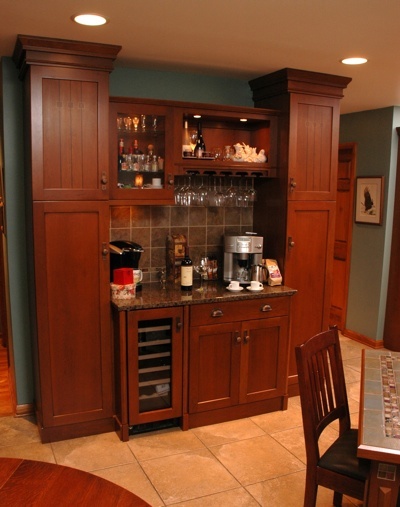 If you are an oenophile, a beverage bar may be the place for wine racks and a wine refrigeration unit. 6. Add pantry storage for special occasion ware. Pantries are making a big comeback in today’s kitchens. Homeowners who enjoy cooking and entertaining often find that a typical kitchen doesn’t have enough storage space. Butler’s pantries, walk-in pantries, tall storage cabinets and free standing cabinets are all options for storing items used for entertaining in one place. For efficient storage of china, serving dishes and crockpots the shelves should be 14 inches deep. 7. Add a custom-built buffet. Electrical outlets can be installed on or near the buffet for warming trays, crockpots and coffee makers. 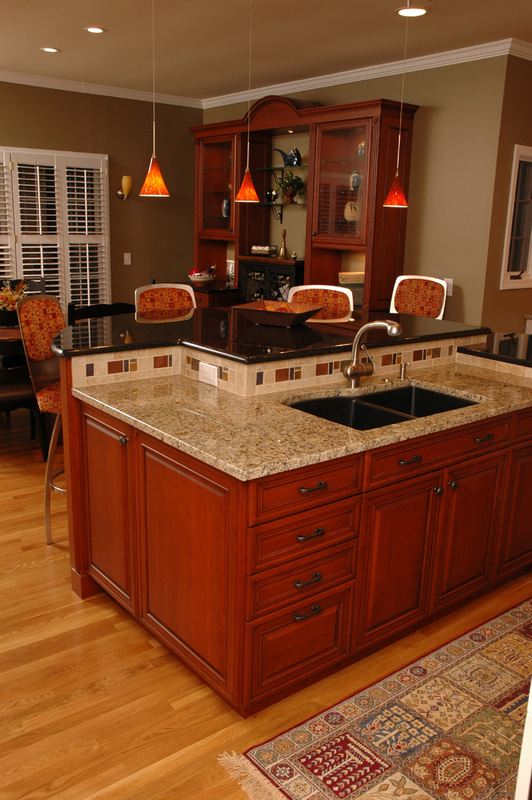 A countertop can be placed on the buffet for food service or crafted to provide overflow seating. The buffet can be an architectural element to divide open space. 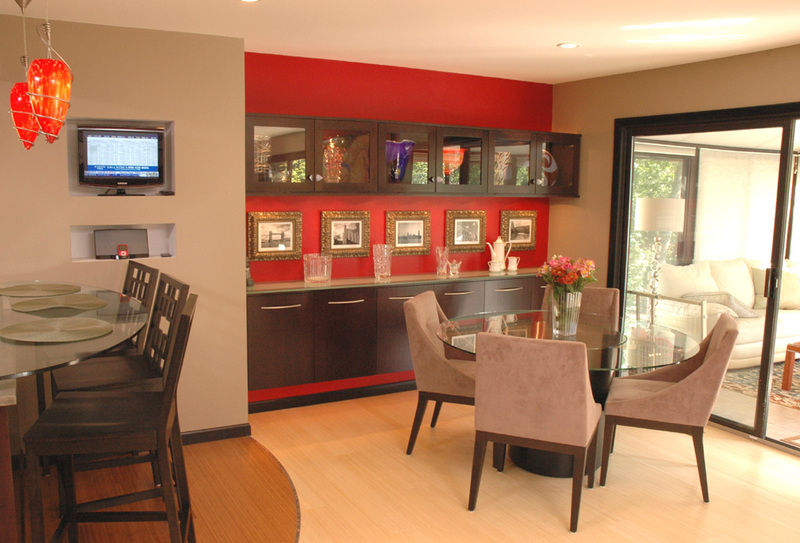 If floor space is tight in a dining area, a custom buffet can be built into a wall. 8. Add a second dishwasher for quick party clean up and two ovens for cooking. 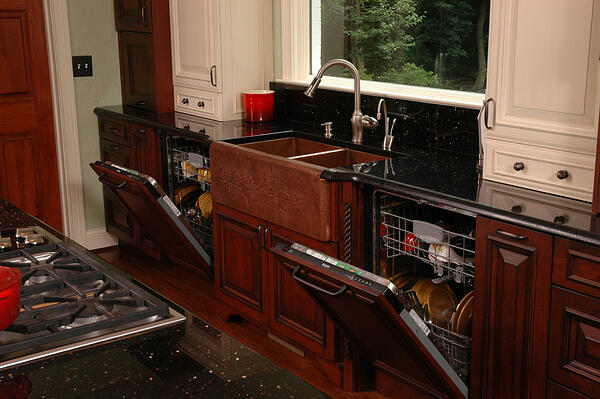 Drawer dishwashers are ideal for cleaning glassware and china. If you entertain, you know the advantages of having two wall-ovens, a range with a double-oven or a wall-oven and range. 9. Add dimmer switches to lighting. Dimmed lights help to create a party atmosphere. Family gatherings are special times. The Hendy family and staff at Neal’s wish you and your loved ones the joy and peace of the holiday season.